There are quite a few folks that spend a good portion of their free time investigating extraterrestrials aka space aliens. They are most likely not interested in the fact that there are new living species being discovered everyday(here on earth). This is likely due to them feeling that most earthly creatures aren’t as cool looking in comparison to their assumption of how aliens look, and the out of this world mystery that surrounds them. While looks are subjective, I kind of agreed. Until I spotted the Turtle Frog. The Turtle Frog (Myobatrachus gouldii) is a recent alien looking discovery we learned about that you may enjoy. It’s a small fellow less than 2 inches (5cm). The Turtle Frog is a pudgy cute round bodied little thing. It has a small mouth suitable for eating small insects and larvae. These cool little dudes are native to Western Australia. So instead of looking to the sky or spying on a clandestine government installations in the hopes that you might catch a glimpse of creatures not of this earth, take a vacation to Western Australia and actually hang out with something cooler. 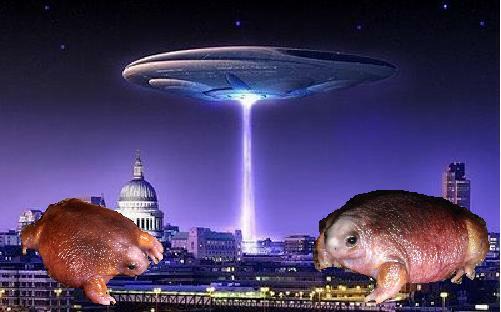 Yes the turtle frog is cooler than aliens because they exist and we can see them, and they have not tried to take over our planet for its natural resources.